Nothing tastes better on a rainy evening than warm rhubarb crisp with vanilla ice cream. Since it's one of my family's favorite desserts, I thought I'd show you how easy it is to make . 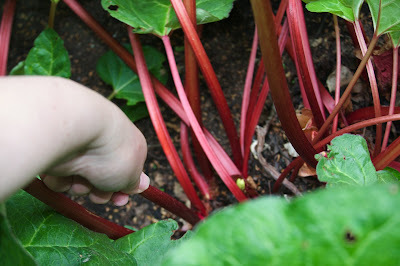 . .
Let's head out to the garden and pick some rhubarb. Remember when the rhubarb was just starting to poke up through the ground? Now look at it! I'm going to need about 12 stalks for the crisp. They're easy to pick—just grab near the base and pull firmly and straight up (that's what she said). I'll easily get two harvests from these plants, maybe three, before the end of summer. I pour it all into a pie plate—almost done, just need to put together the topping. Finally, I stick it in a 375-degree oven and bake it for 45 minutes. I let it cool (despite my husband and kids screaming from the family room, "Is it ready yet?" every 5 seconds) before spooning a couple scoops of vanilla ice cream on top and serving. Yummy! That looks so yummy! I am going to try your recipe. When is rhubarb usually ripe? I have one lone plant in my yard. Hey! Thanks for stopping in! My rhubarb is ripe now, and I've already had to cut back two plants that were going to seed. I'll be pickin' and choppin' and freezin' this week, so the plants can grow a second harvest by summer's end. It's pretty hard to kill rhubarb (unless you've got a dog), so you could probably divide the plant you've got and start a second one. I've always like the look of a row of 3 or so rhubarb, even if they're not used for eating, because their leaves are so big and green. 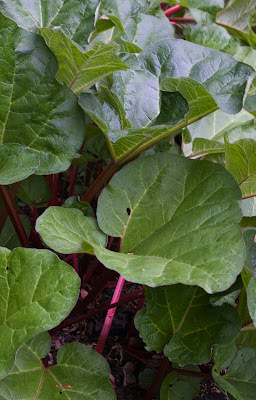 The rhubarb I've got now is in my garden and gets a lot of sun. It's good rhubarb, but not the best I've grown--which was right next to the house in partial shade.